My cassette isn’t cutting through all the strips. What can I do? What if my first strip is narrower/wider than the rest of the strips? What is the most popular cassette combination? The most popular cassettes are the #8, #6, and #4. They sometimes switch places, but it is generally those three. Fine cut uses #3-#6, where more primitive cut is #7-#10. What is included in the TS1000 Cutter Assembly? The Cutter Assembly comes with one standard cassette of your choice, the Cutter Caddy carrying case, and a brush and wrench. 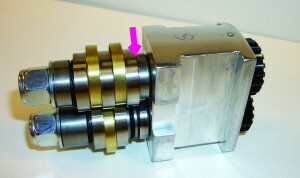 The Cutter Assembly can be ordered as a Long (or Kitmaker) Assembly for an additional fee. However, we recommend most rug hookers stick with the standard size. Does the Cassette Case (TS79103) accommodate both standard size and long (Kitmaker) size cassettes? Yes! The new and improved cassette case has removable foam blocks to it can hold both sizes, or a combination of sizes. Do I need to sharpen the cassettes? There is no need to sharpen the cassettes. They have steel rings that work by pressure, which is why it is SO important to keep your cassettes clean by using your brush, or even canned air, after each use. Is there a warranty on Bee Line Art Tools equipment? Yes! There is a one-year parts and service warranty on our products from the date of purchase. Just send in your name, address, phone and e-mail and what product was purchased with serial number for the cutter assembly via e-mail at rughooker@beeline-co.com or send it in the Comments section on the Contact Us tab. What if my old Townsend product needs repair? If you have an original Townsend product that needs repair, give us a call at 866-218-1590 and we’ll be happy to take a look and give you an estimate for repair.